If you've read any previous posts you'll know that I am a huge nail art fan and I try to jazz up my nails in the most easiest ways. Today I'm sporting a mint nail with glitter gradient tips topped with a matte coat. I'm a huge fan of glitter and had just bought a matte top coat, so I was intrigued to how they'd work together. 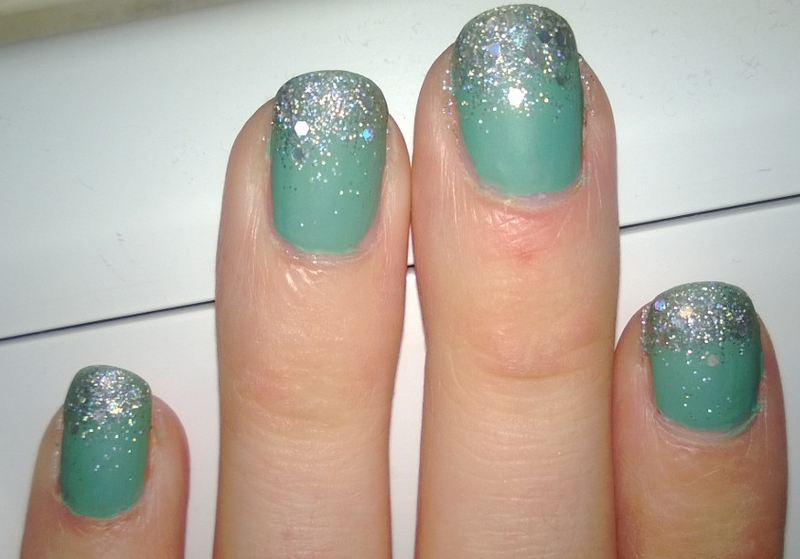 OPI MERMAIDS TEARS - A creamy, glossy mint colour. OPI SERVIN' UP SPARKLE - A sparkly top coat with little glitter and larger hex glitter that have a holographic shine. RIMMEL 5 IN 1 BASE AND TOP COAT - A shiny clear varnish used for top and bottom coat. First I applied Mermaids Tears. I used 2 coats and then waited to dry. I then dabbed Servin' Up Sparkle on the tips. I then kept layering, adding a varied amount of glitter to create the gradient effect. I used about 5 coats, and on the last coat made sure I had a few larger hex glitter to create more of a variety. Lastly I applied 2 coats of the Rimmel Matte Finish varnish. And that's it! It's pretty simple and took no amount of skills - Just time! I took me an hour while sitting in front of the television to complete both nails as I wanted each coat to be completely dry before applying more. I will be reviewing the Rimmel Matte Coat and 5 in 1 Base and Top Coat very soon! It's absolutely amazing that you've done this yourself. They look incredible! They turned out so nice! I have OPI mermaid tears so i may try this tutorial out for myself, thanks! they look gorgeous! just like a mermaid tail! Beautiful nails!! I'm glad you were the blog before me on Sunday Sync! I like the matte and glitter combo, interesting and original!